Having your air conditioner break down on a hot summer day is terrible. This could have happened for a variety of reasons, and you will need to hire a professional air conditioning expert to fix the problem. Giving your air conditioner a maintenance service every year is the best way to prevent it from breaking down when you need it the most. All air conditioners have many components and moving parts inside them that make them cool your home. They must be inspected to keep them functioning throughout summer. Advanced Heating and Cooling provide an air conditioner repairs service that is renowned throughout Melbourne. 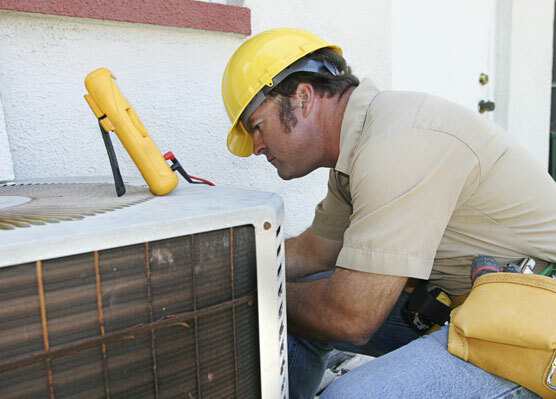 Our qualified technicians can identify and fix all types of issues that air conditioners face. We have listed four common types of air conditioning repairs that your system may require. When air conditioners go unused during winter, they can accumulate dirt, pollen, grime, and other debris that can block the filter pads. If left untreated, these blockages can cause breakdowns by obstructing your unit’s pump, fan, or motor. The compressor inside your system is tasked with pressurising the refrigerant that runs through it. This is necessary to allow heat to be released. It has its own motor and electrical wiring, and it is a component that works very hard. Because of this, different problems can develop, such as motor and electrical issues. Air conditioners have two fans: the evaporator fan, known as the blower, and the condenser fan, which resides in the outdoor part of the unit. Condenser fans are designed to remove the heat from your system, while the indoor blower pushes cool air into your ductwork. Common problems that can develop with fans are issues with the belts, motor problems, and loose or bent blades. A leaky refrigerant can lower the level of refrigerant in your air conditioner. You may notice that the air gets warmer rather than cooler, and leaks are often the cause of this. If this does not get repaired, this can lead to further problems. Finding these leaks are hard, so you need a professional air conditioner repairs service to handle a refrigerant leak. Advanced Heating and Cooling are proud of the superior customer service and competitive pricing we offer our clients for air conditioner repairs in Melbourne. Call us on (03) 9310 1990 today.